In Wasilla on Saturday, some 300 conservatives gathered to remember the 9/11 attacks. GOP Senate candidate Joe Miller was getting the attention. But then Sarah Palin showed up. The crowd met at the Menard Sports Center, a hockey and soccer facility championed by Palin when she was mayor of Wasilla. It was organized by the Wasilla-based Conservative Patriots Group to honor those who lost their lives on 9/11. But Miller and certainly Roach were overshadowed when, much to the delight and surprise of many, Palin showed, got on the stage, and asked the now-familiar, “Do you love your freedom?” question. The response indicated that yes, they did. And that wasn’t the only thing they loved. The rally was a prelude to Saturday evening’s Glenn Beck event in Anchorage. Palin is scheduled to make an appearance alongside Beck tonight. 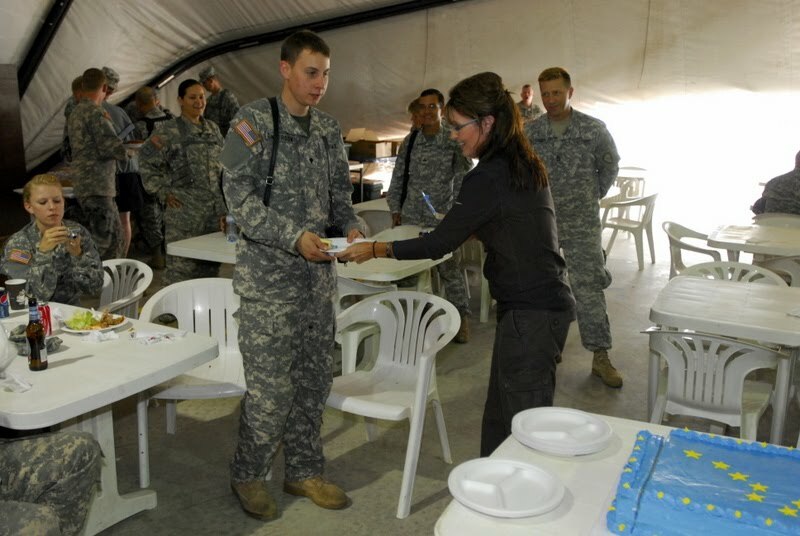 After her speech, Palin stepped off the stage and began a long round of handshakes and autograph signing, where she shook hands with everyone from Mead Treadwell to Sam Little, and signed everything from copies of her book to the back of a little girl’s shirt to a small rock that a middle-aged woman handed her with a smile. The crowd was happy and excited to be so close to their former governor, pressing close to shake her hand and get a quick picture. When a reporter asked Palin to identify the biggest threat to the U.S., she answered “Our debt, which is a natural security issue,” before turning back to her admiring fans. 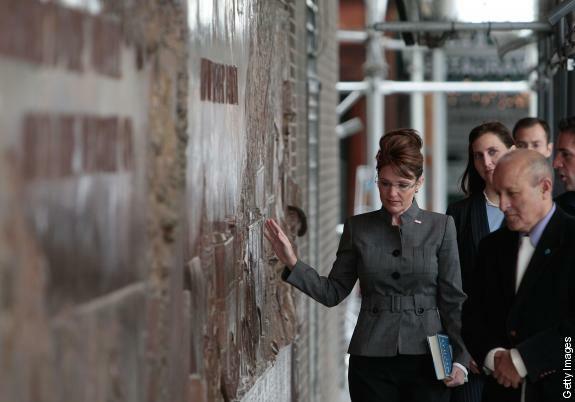 Palin’s daughter, Piper, quickly became bored with the whole scene and asked her mother when they could go. The horrific events that transpired on September 11, 2001, have forever changed the face of America. Like many of you, I awoke on September 11th thinking about everything I had to accomplish that day. As a 20-year-old college student, I was busy with the tasks at hand. The papers, homework and journalism writing assignments were going to keep me very busy on this Tuesday morning. I rolled out of bed at around 6 a.m. and put on my workout clothes, thinking to myself that the sooner I got done working out, the sooner I could get the other items crossed off my check-off list. Little did I know how much my life would change–how much America would change in a matter of minutes. As I sat on the bed and put on my running shoes, I turned on the Today Show and I immediately stopped what I was doing because of what I was witnessing on the screen in front of me. The normally clear, crystal blue New York skyline was smoky, hazy and just plain eerie. I immediately listened as Matt and Katie reported what was going on. At first it was reported that a small commuter plane had crashed into one of the World Trade Center towers. After hearing this, I thought to myself: “oh, okay some pilot either ran out of gas or had a mechanical failure, hopefully everything will be okay.” After hearing this, I went for a quick run. When I got home, I turned the television back on assuming that whatever had transpired before I left had been figured out and that everything would be all right. Instead, what I saw on television really scared me. It was being reported that it wasn’t a commuter plane after all, but a large plane. People were shown running down the street, dazed and confused in their business attire. I will never forget the horrific looks of those poor people’s faces. These were successful, hard-working Americans who now seemed to be fleeing to safety. These traders, executives, secretaries, maintenance workers and many more business professionals became a blur under the smokey haze and ash that covered everything in sight. Immediately I thought, is this a terrorist attack? Being the journalism student I was, I didn’t want to jump to conclusions, and I hoped I was wrong, but everything I was watching seemed to be pointing in that direction. Unfortunately all my premonitions were indeed true, as I saw an object hit the other tower. When people talk about reality television, usually the actions are staged, but this was true a reality show, a frightening series of events that I could not believe were really happening. I kept hoping that everything I was seeing unfold was just a bad dream. I wanted to put my flannel pj’s back on and climb back into bed and cuddle up thinking that when I awoke everything would be normal again– everything would be the same. Yet, this WAS really happening; this WAS reality. Right them and there, I knew America had been attacked. How could this happen to America? I asked myself. Now, I can see one fluke accident, but the second plane hitting the other tower was just a little too coincidental. After the second tower was hit, everything just happened so fast that it is hard to put it all in chronological order because I was just trying to wrapped my head around how someone could attack America, the land of the free, the home of the brave. Before this day, I had always felt safe and secure. I never worried about going to amusement parks or sporting events. The only thing that scared me when I had to fly was my fear of heights, but that didn’t stop me from flying. After watching the event unfold before my eyes, the care-free America I had once known seemed an all too distant memory. The catastrophic events of September 11, 2001, not only changed America as we knew her, but also us as individuals. Before the tragic events of 9/11, I took for granted my family and friends. I took for granted the little things that I now look at with intense pride. While I have always loved America and took pride in being an American, September 11th made me realize how proud I was to <em>be</em> an American, and I wanted to show this pride everywhere I went. From the ashes, people came to the aide of others. Strangers helping strangers, putting their lives on the line to protect their fellow man and fellow woman. Amid the tears, heartache and screams of anger came a bright beacon of light, and amid the ashes, people joined together and united as one. I was so proud of our brave men and women in uniform who risked their lives as they rushed into those building buildings, knowing that they may not make it out alive. I was so proud of the normal Americans too. The employees who refused to evacuate the buildings of the World Trade Center, opting instead to stay inside and go back up those floors to try to get others out. Those brave men and women at the Pentagon who came together to bring out the burned and wounded. Whatever you may think of Donald Rumsfeld, he will forever be a hero for rushing in to help and rescue others. Who could forget the brave men and women of Flight 93? As I write this, I have tears in my eyes, as I think of the sacrifice those amazing individuals made in protecting those on the ground. I cannot begin to imagine what they must have gone through. But in true American form and with tremendous composer, they did what few would do. You see, fellow readers, while the events of September 11th will forever be hard to comprehend and digest, this day brought out the best in our fellow man. Men, women and children of all races and religions came together for a common purpose, a common goal of helping those in need. I’ll never forget when our elected officials stood together, hand in hand and sang <em>God Bless America</em> with more emotion than I had ever seen from from those whom we elect to serve us. After a tumultuous election, all Americans, regardless of party, stood together behind President George W. Bush as he comforted and hugged the hurting and the suffering. Goodness, how the times have changed. I have to ask, “What the hell happened?” “What happened to us?” We came together after an event that the terrorists hoped would forever tear our country apart, only to become divided once more. While President Obama promised to bring hope and transparency to America, he has only brought hype and pain. I say this because instead of honoring the fallen and our brave men and women in uniform, he talks of the waste of money that has been spent on the wars and continuously apologizes for America’s actions to all whom will listen. What does this say to our good men and women fighting in Iraq and Afghanistan? That what they are doing over there <em>was</em> and <em>is</em> a mistake? I hate to even write this, but I have to wonder if President Obama wants us to forget about what happened on 9/11– But, Readers, whatever you do, it is important that you NEVER FORGET! NEVER FORGET the people who risked their lives to save their fellow man! NEVER FORGET the way America came together! NEVER FORGET the sacrifices so many men and women in uniform are making for us as they risk their lives day in and day out just so we never have to relive the tragic events that happened on that day. NEVER FORGET what happened on 9/11 and the way the nation came together on 9/12because now more than ever, we NEED to be reminded that America is the land of freedom and opportunity, the land of the brave. NEVER FORGET the 2,974 innocent individuals who lost their lives. Today we honor the memory of those who died in the Twin Towers attacks and pay tribute to the heroes of that day and the days that followed. We also want to thank President George W. Bush for his leadership during that crisis and for his policies that helped keep us safe from terrorist attacks during the rest of his tenure in office. Here is another video by Taylor Nelson that contains scenes, both tragic and memorable, from the day that changed America forever. 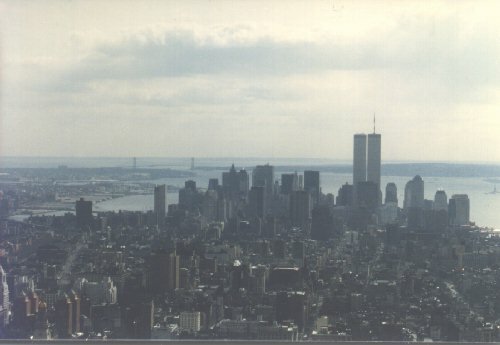 I shot the first two photos in the early 1990s, the first from the Staten Island Ferry, and the second from the 86th Floor Observatory Deck of the Empire State Building. 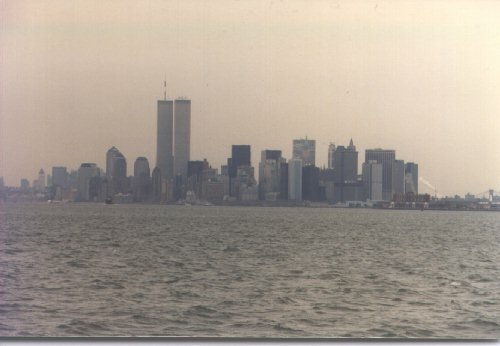 The Twin Towers were an important part of my life, as they frequently punctuated childhood visits to Manhattan. I worked there for a week as a temp; worked six months in the neighborhood, and celebrated my first wedding anniversary there. When these attacks were launched upon our nation, I was working for Con Edison doing desktop support and LAN administration. I had been there about 18 months and had the good fortune to be at at our Victory Blvd. facility in Staten Island, some 30 miles away from the Twin Towers that day. My wife was supposed to be exiting the Battery Tunnel at the time the first plane struck as she would have been on her way to a dance class. After an hour of frantic calling, I learned that she stayed home. I wanted a Reagan-like response to the September 11 attacks. As the hours passed, I waited. Nothing. Our response would come October 7, 2001 at 12:30 EDT. I was in Boston with my wife as we visited a relative of hers who was attending Harvard University on a partial scholarship. That day, I felt I had to visit all the historic sites in the area — Faneuil Hall, Bunker Hill, Lexington, Concord. 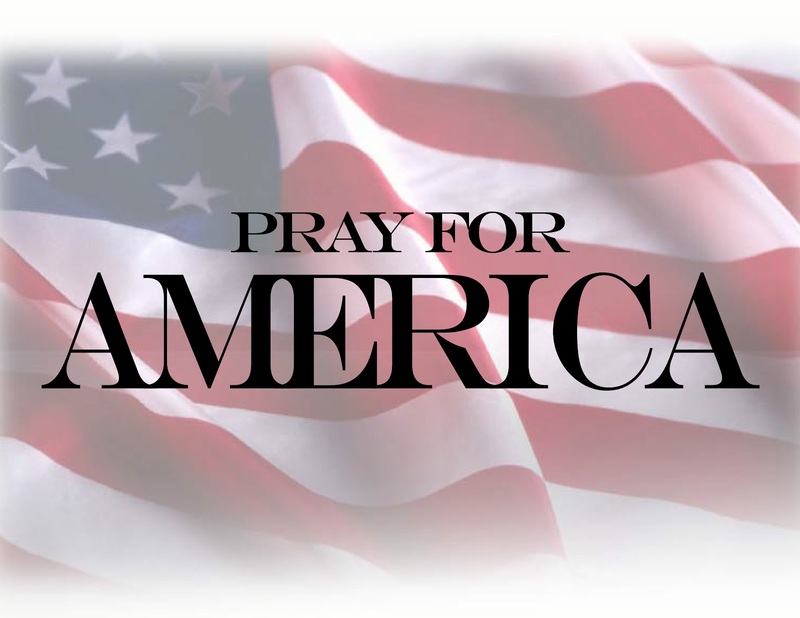 When I heard the Battle Hymn of the Republic being played on church bells, I ran to find a TV, and that was where I saw that the War in Afghanistan had started. While George W. Bush was no Ronald Reagan, he did keep us safe following 9/11, for there was not one attack on US soil. Indeed many attempts were foiled and many Al Qaeda sleeper cells were busted up. In 2009 I had written that “[a] nightmare scenario is unfolding at the WTC site where neither the Twin Towers, nor what was chosen to replace them will be built as envisioned.” I am happy to report that my assessment was wrong. One WTC (Formerly “Freedom Tower”) Viewed from two blocks north on West St. 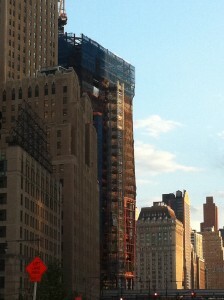 The building is at the 36th Fl. level and will rise to 1776 feet. Close-Up of 1 WTC passing by. 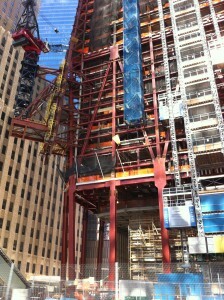 Notice the tower crane attached to the building. This crane is used for lifting the forms used in concrete pours. Tower 4 is under construction now with the concrete core being the priority. Then, the steel will takeoff like gangbusters. The building will rise to 975 feet and is mostly pre-leased. 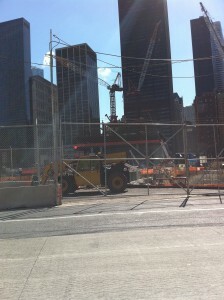 Passing structures for the 9/11 Memorial at the WTC site. Notice toward the left of one of the concrete structures one of the 16 Swamp White Oaks that were planted for the Memorial on August 28, 2010. 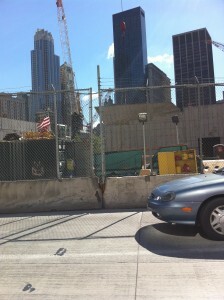 You can see regularly updated progress on the WTC site at the Port Authority of New York and New Jersey’s WTC Progress site. It was at the same Victory Blvd. facility nearly seven years to the day following 9/11, that I would hear the resurrection of Ronald Reagan. As I pulled my assigned minivan out of the lot and turned on the radio, her voice and words would so transfix me that after two blocks I could not drive anymore. The yearning I felt at that Victory Blvd. location some seven years earlier was answered by a woman’s voice. 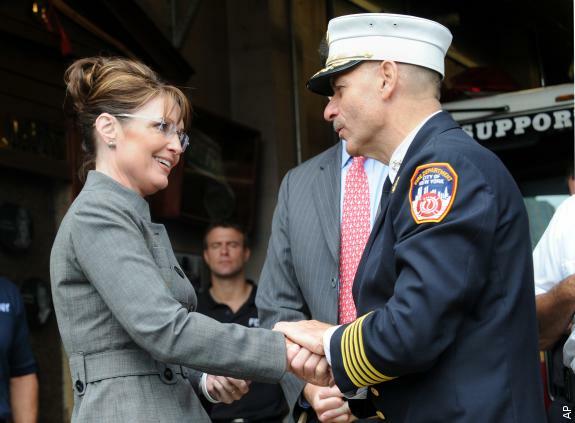 Watch as she interrupted her own VP campaign to return to Alaska and bid her troops farewell to Iraq on September 11, 2008. Her son, Track was among them. 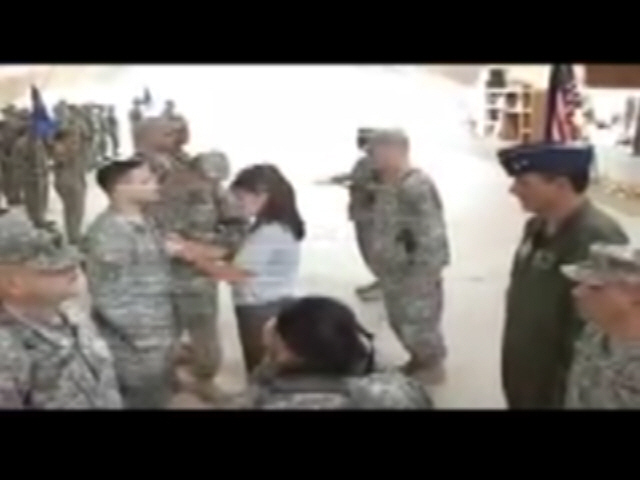 She saluted her Non-Commissioned Officers…. 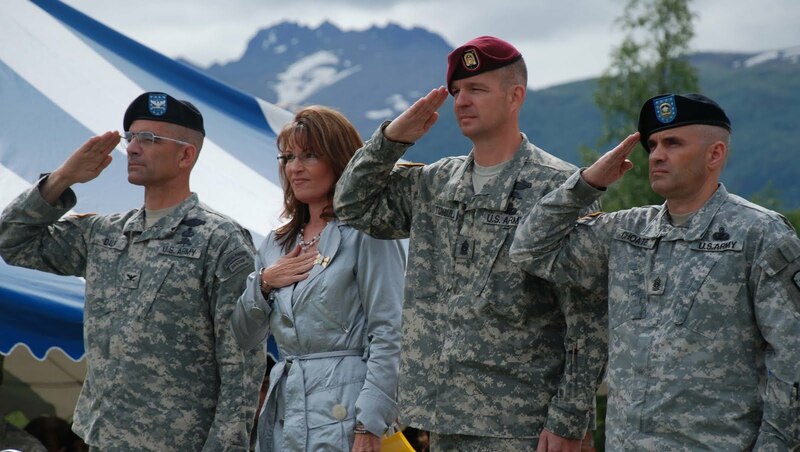 “As commander-in-chief, Governor Palin is the one we look to for leadership and inspiration while serving and defending the sovereign boundaries of Alaska,” said Lt. Gen. (AK) Craig E. Campbell, Adjutant General of the Alaska National Guard (Kosovo, 2009, ¶4).